One of Ireland’s largest peat harvesting companies stands accused of the unlicensed stripping of peat from a bog at a site in Co Westmeath currently subject to court proceedings. According to Friends of the Irish Environment (FiE), Harte Peat has been excavating wet peat at an alarming speed and scale at the site in Derrycrave, Co Westmeath. Photos taken by the NGO and seen by The Green News show deep excavation of wet peat up to a couple of meters deep at the site on 28 July 2018. Aerial footage from mid-August also seen by The Green News shows a digger excavating peat at the site. Instead of milling the top few millimetres of peat off the surface, FiE Director Tony Lowes says that the photos and video show that the company is “just hauling it out with a JCB machine”. The end result is a “great big pit” in the ground, Mr Lowes said, which is nothing but a “complete ecological disaster”. Based on the works that he has seen at Harte Peat’s site, Mr Lowes fears that a single year of commercial digging may take hundreds of years to recover. “Whole fields have been literally gouged out, down to the minerals below, making future regeneration almost impossible,” he said. Mr Lowes said that Harte Peat is operating without the appropriate license from the Environmental Protection Agency (EPA). The EPA brought a legal case against Harte Peat in 2013 for unregulated peat activities in Co Westmeath above the 50 hectares licensing threshold. Peat harvesting companies are required to obtain an Integrated Pollution Prevention Control (IPPC) licence where peat extraction is being carried out in an area of land exceeding 50 hectares. The bog in the photo and aerial footage is part of the Derrycrave lands in Co Westmeath that are the subject of a court case, the EPA told The Green News. While the EPA said that it cannot comment further on this case as it remains before the courts under appeal by Harte Peat, an agency spokesperson said that peatlands have a range of ecological functions including maintaining biodiversity and water quality, carbon storage, and flood reduction. The spokesperson said that the “degradation of peatlands” is an area of concern for the environmental watchdog due to the potential loss of carbon and contribution to greenhouse gas emissions and air pollution. “Peat cutting is identified as one of the key pressures on Ireland’s habitats and species including causing direct habitat damage,” the spokesperson added. 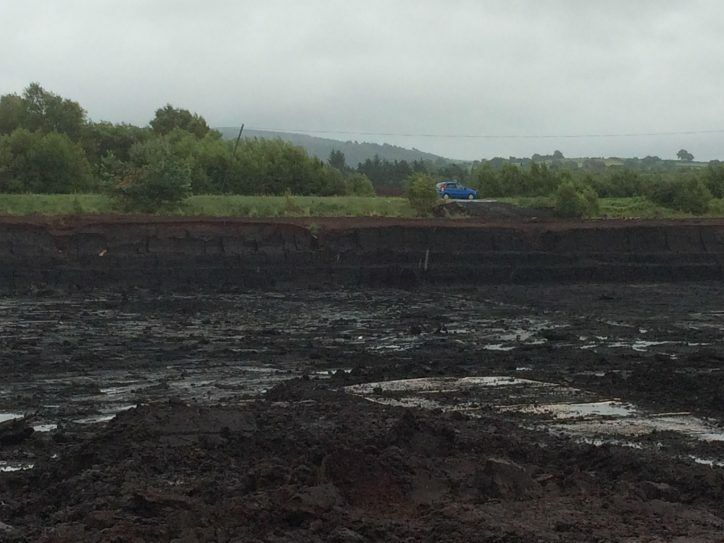 In a statement, Westmeath County Council said that it is aware of ongoing peat extraction at the site. The Council said that it has served two warning letters to Harte Peat for “unauthorised peat extraction” at the bog. Speaking to The Green News, Harte Peat’s Managing Director Tommy O’Harte confirmed that the company is “extracting wet peat from that site”. Mr O’Harte said that as the lands are subject of ongoing court proceedings, he does not wish to make any further comments about the Derrycrave lands at this time. A spokesperson for the Department of Planning said that it is a matter for the planning authorities within County Councils to take enforcement action in relation to any unauthorised peat extraction. “The Department is actively progressing the drafting of European Union regulations with a view to putting in place as speedily as possible a robust and effective legislative underpinning for a proposed new regulatory system for the large-scale peat extraction sector,” a Department statement reads. Under the new system, it is expected that the EPA will be required to carry out an environmental impact assessment as part of its examination of license applications for peat extraction on sites of 30 hectares or more. The Department of Planning said that consultations are continuing with the Department for Climate Action and the Environment (DCCAE) and the EPA with a view to finalising the draft regulations for signature as soon as possible. Further photos from the Derrycrave site taken on 28 July 2018 show a Peat Bed transportation trailer at the site. Demand for the product shot up this summer as straw prices skyrocketed following the summer drought. “Ironically, this new market arises from extreme weather events due to global warming which will only be increased by the use of peat for animal bedding,” Mr Lowes said. Mr O’Harte said, however, that the peat harvested from the Derrycrave site is “specifically and solely used for the mushroom industry”. “None of the peat bed we are using is coming out of that site,” he added. 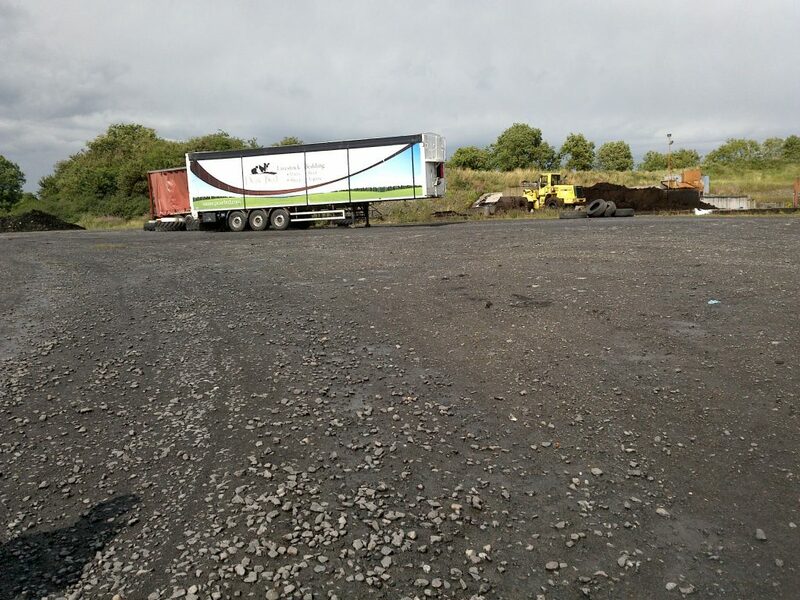 When asked to explain why the Peat Bed transportation trailer was at the Derrycrave site, he said that such pieces of equipment “can and are used to transport a wide and varied selection of goods”. “This is no different to having a SuperValu shopping bag and then going to a Tesco or Dunnes Stores and using that bag to do your shopping while there. It doesn’t make those items suddenly become SuperValu. So be it with the trailer,” he added. He did say, however, that all of their peat bedding comes from sites with IPPC licenses and that this can be supported with “actual facts”. When The Green News asked Mr O’Harte to further elaborate on this point, he said that all he could state was that “no peat for our peat bed business comes from the Derrycrave site”. “I do not wish to elaborate further than I have already on where the peat for our peat bed business comes from as it would be commercially sensitive to do so,” Mr O’Harte added. 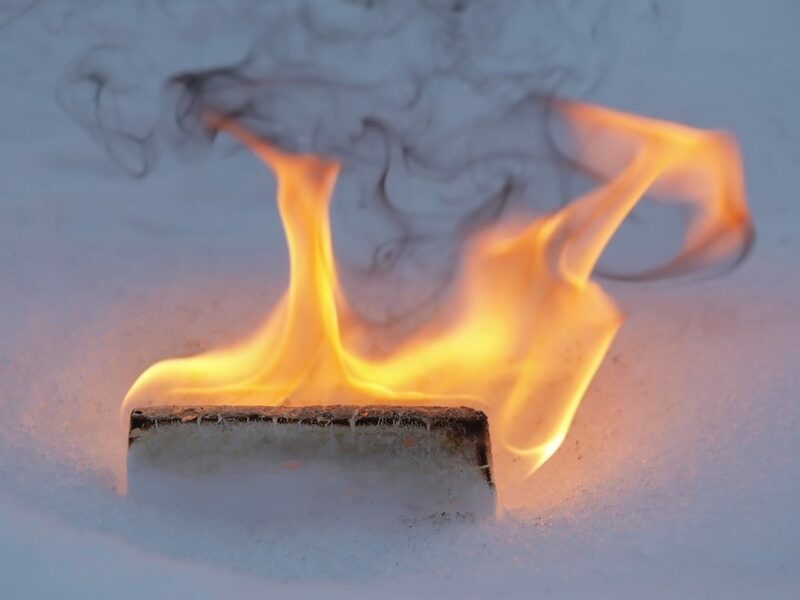 Regardless of the final destination of the peat, University College Dublin’s Dr Florence Renou-Wilson told The Green News that the photos of the site show “environmental and climatic disasters”. “All peat extraction sites are significant carbon dioxide emission hotspots and they also pollute waterways,” the peatland scientist said. Dr Renoa-Wilson, who has previously investigated emissions from peatlands, said that, as the sites have been stripped of vegetation, they are “totally devoid of biodiversity” and are “prone to fires”. “Altogether, they will have a disastrous feedback effect on climate change,” Ms Renou-Wilson said. Bord na Mona, which operates the Edenderry peat-fired power station, recently outlined plans to transition to new sustainable businesses across its bogs and landholding. The move will see the semi-state that owns seven per cent of Irish bogs phase out peat burning and move to rehabilitate tens of thousands of acres of bogs to support biodiversity and eco-tourism projects in the Midlands. 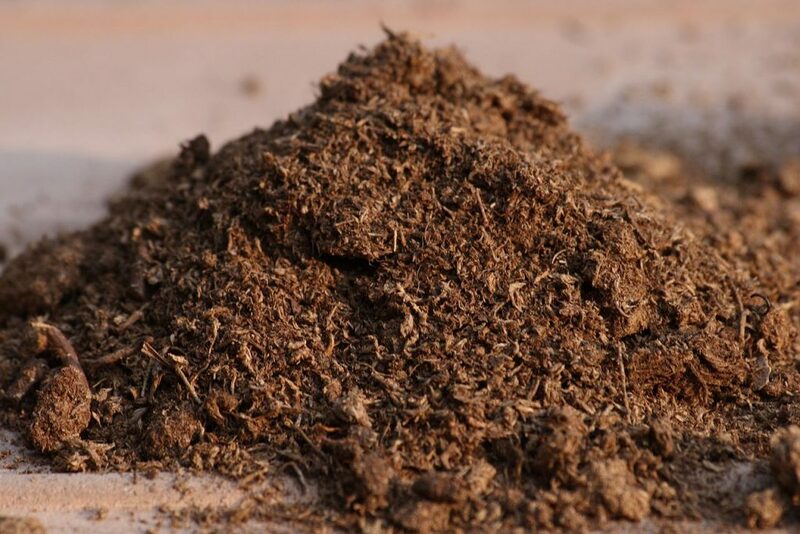 The company, however, will continue to harvest peat for horticulture and domestic fuel and announced plans this summer to increase its own production of peat bedding for livestock. Mr Lowes questioned the Government’s commitment to stop using Irish bogs despite assurances that peat will be phased out as a source of fuel by 2030. “One of the problems we have is that the Government keeps saying that we’re phasing out peat for power production but they don’t say that horticultural production is fast becoming a bigger operation for Bord na Móna than the actual extraction of peats for power plants,” he said. Earlier this month, FiE wrote to Bord na Mona Chairman Geoff Meagher asking why the company was pushing peat bedding while also promoting itself as having a “clear focus on environmentally and economically sustainable approaches”. In a statement, Bord na Mona told The Green News that the semi-state has been supplying peat bedding to farmers since the 1940s and that the summer shortage of straw had placed a “huge burden” on the farming community. 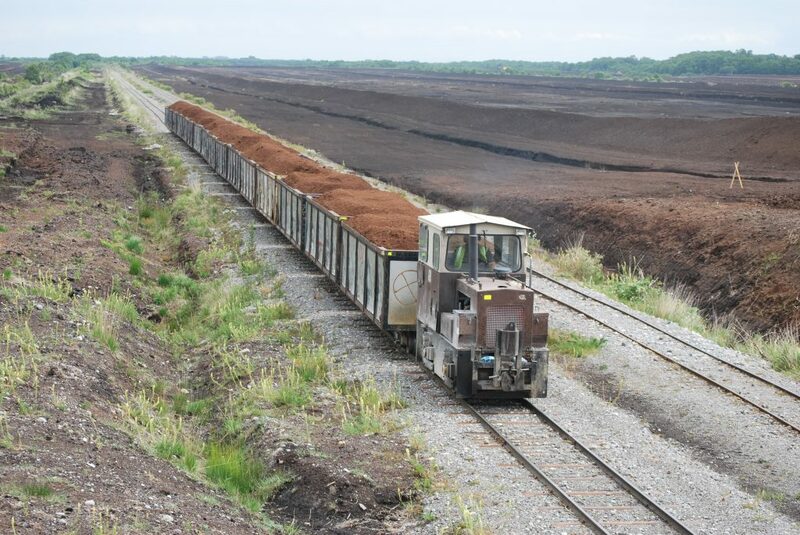 The Department for Climate Action and the Environment told The Green News that any increase in peat bedding supply is an “operational matter” for Bord na Mona. The Department said that the semi-state’s supply of peat bedding to the market “goes some way to alleviating the fodder crisis” by freeing up straw that was intended for bedding.